In 1930 congress authorized the Bonneville dam to be built. The emphasis was on "taming the Columbia" (National Research Council, 1996). Congress ignored that the Bonneville dam would alter most of the river's ecological processes by changing the flow of water, sediment, nutrients, and biota. These changes influence the salmon population. The population levels of all salmon in the Pacific Northwest are down precipitously. The sockeye and three populations of chinook are even on the endangered list(Gillis, 1995). The salmon are endangered because no one has invented a salmon restoration plan (involving dams) that is effective for both the salmon and the parties with lawful interests. Salmon ladders have attepted to resolve this issue, however they really are not effective. The reason for this revolves around the salmon's lifecycle. The smolts (young river-spawned salmon) go out to sea for a year to only return to thier natal stream (they imprint, using olfactory cues, on the stream when born). By limiting the area of passage, salmon ladders permit only a few salmon to make it to their natal stream. This decreases the overall number of salmon in the system (death of adults result in less smolts the following year). Salmon ladders limit the area of passage and habitat. Before any dam development took place on the Columbia River, 260,000 mi2 was accessible to salmon. Today only 73,000 mi2 of the original area is accessible to salmon (National Research Council, 1996). 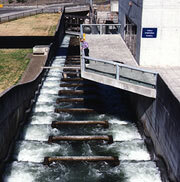 One may think salmon ladders provide a safe passage for adult salmon at the Bonneville dam, however many young, migrating salmon die here (National Research Council, 1996). There is a fine line between the laws to protect, mitigate, and enhance salmon populations affected by dams, while assuring the region an effective and economical power and water supply. The salmon in the Columbia River need clear flowing water, clean gravel, and a suitable source of food for survival. This clearly is not the condition of a river when a dam is built. As the beaches and sandbars downstream diminish, so do the salmon. This is due to the single-thread channel effect (Ligon et al., 1995). The reduction of peak flows keeps the water off of the flood plain, eliminating mid-channel bars (used for protection and spawning grounds). The average seasonal discharge of the Columbia has been drastically altered. Ranging from no flood control to the discharge of 50,000 CFS (very low) (National Research Council, 1996). Spawning grounds are also lost with increasing depth, decreasing temperature and loss of sediment recruitment (Elfring, 1990). The coarse glacial outwash of sediments occurs with peak flows and erosion. This erosion does not take place when the flood plain disappears and single-thread channels emerge. The reduced flow not only reduces spawning grounds, but also increases predation. Lack of variation in the river system makes for a constant environment. Terrestrial animals around the Bonneville dam become aware of salmon location and routinely feast upon them. The salmon population will continue to decline with the evolution of a single-thread channel. The single-thread channels are not just a threat to salmon, but hatchery usage (needed when a dam is constructed) is also a concern. The use of hatcheries has become a basis in the management of salmon, but this technique adds to the decline. According to Jack Stanford, director of the University of Montana's Flathead Lake Biological Station (Gillis, 1995) there are 90 hatcheries putting salmon randomly into streams. Hatchery fish that are introduced are not genetically compatible or as resilient as fish already in the stream. The salmon currently in the system also become overwhelmed by the numbers (despite being sturdier), and die. The Bonneville hatcheries have had substantial adverse effects on the native salmon. The lack of genetic diversity and problems related to health, behavior, and physiology are a direct result from the Bonneville dam construction and hatchery usage. The hatchery fish have even exceeded the stream capacity (National Research Council, 1996). With the use of improperly managed hatcheries, unfit and resilient salmon are being replaced. This can ultimately effect the entire population in the Columbia River. As dams are built, salmon are fighting with extinction. Due to the drastic changes in the river system (resulting from dams), the salmon are unable to find proper conditions to reproduce. According to the Seattle times, previous techniques in protecting migrating salmon has never worked. It is amazing how the salmon managed to persist during great climate change (through the Pleistocene), yet dams are able to get them to an endangered status. However, dam removal (of the Bonneville) would be enormously expensive and adversely affect the salmon population (their spawning grounds have been permanently destroyed). This does not mean dams should continue to be built, but a better salmon management program is essential. The Bonneville Dam needs to have adequate fish passage facilities and other advancements (National Research Council, 1996) for the salmon to survive.